Getting Through the Terrible Twos, Threes and Fours! Many parents wonder why the terrible twos often continue into the threes and fours! For children this age, it's very normal to see some acting out as kids are becoming more independent and developing an awareness that they can make their own choices. That independence can be adorable but also challenging! Below are some tips to get you through the tough times! The best type of discipline for kids this age is immediate and consistent. Avoid talking too much or trying to explain why their behavior is not acceptable. They are too young to understand. Time-outs and behavior charts work very well with this age group. Time-outs are great tools for unsafe or aggressive behavior such as hitting, biting, or running away. A time-out gives the child time to cool down until he is ready to join the group again. When your child is behaving in an unsafe way, you can give him one warning and say something like, "You need to stop hitting. If you hit again, you will need to take a time-out". And, if the child hits again, put him in time-out and say, "You chose to hit again. Now you need to take a time-out". Then, don't talk about it anymore as a child at this young age will not be able to understand long explanations. Once time-out is over, the child can join the group, and that's that! Behavior charts can be effective with kids this age, though the reward needs to be immediate since they are so young. Also, you should only work on one behavior at a time so your child doesn't become overwhelmed. You may be able to try two behaviors at a time, but no more. And when you see behavior that you like, the child should receive an immediate reward such as a new sticker on her chart and/or a treat from a treat bag. The key is that the child receives the reward immediately. Focus on very specific behaviors. For instance, instead of using the behavior "listen to grandma," you may want to say "pick up toys when grandma tells you to." "Listen to grandma" is too general and may be confusing to a young child. When the child picks up the toy, make a big deal, tell her that she did a great job, and mark her behavior chart with a sticker. At this point, you can also give her a treat if you wish, but in many cases, the sticker is treat enough! In addition, avoid getting into power struggles with your kids. If you find yourself getting angry, yelling, or chasing them around, then you are losing the battle. 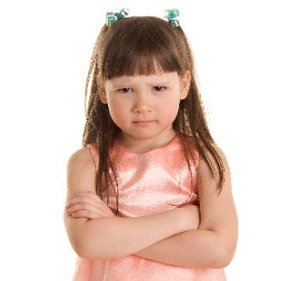 Kids this age will continue to misbehave if they feel that their behavior is rewarding them in some way. Even negative attention from you is attention. So make sure that you avoid battling with them. Also, set aside some positive, one-on-one time with your children doing activities like reading, going for walks, or playing a game. You may begin to notice that their behavior changes when you give them positive attention instead of continuous negative attention. Remember to catch your kids being good. When you see behavior that you like, let them know. Tell them that they are doing a great job! With consistency and patience, you will be able to get a handle on some of those tricky toddler behaviors!